Camping, boating and road tripping in an RV were once considered “roughing it” activities, meaning you had to trade your electronics – and sometimes comfort – to enjoy Mother Nature. That’s no longer the case thanks to modern technology and solar power. Power sources can give you the best of both worlds. You can sleep under the stars in your favorite tent while finding constellations with your smartphone; you can use GPS to navigate the open waters; you keep that RV at a comfortable temperature – for everyone in the family – and so much more. But what type of power source or generator should you use while enjoying your favorite outdoor hobbies? If you’re planning to spend a decent amount of time in the great outdoors and want to keep your devices or must-have items powered, you need an option that is easy-to-use, portable, and cost-effective. Portable solar power technology has advanced so far to give you all of the above and more, giving you power source options that can be easily set up, stashed, and stowed. Plus, sustainable travel and adventure is a part of responsible stewardship. With solar power, you can sleep easy knowing you’re not polluting the air the way you would with a gas generator or power sources. There are a lot of solar panels and generators out there, but your needs will probably vary depending on your activity of choice. Here’s how to find the best one for your next adventure. When it comes to camping, you don’t want to be weighed down by bulky, unnecessary tools, but you also don’t want to be left in the dark. Find a slim, compact and lightweight solar power panel like the Goal Zero Nomad 13 to fuel your electronic needs. Portable solar panels are lighter and easier to pack in and out than you would think; you can tie them to the outside of your backpack or tent to charge up while hiking or hanging out in camp, then use the energy generated to charge a power bank. Little solar-powered additions to your pack can also making camping a little bit more comfortable. The MPOWERD inflatable solar lantern, for example, can make it easier to read at night or, let’s be honest, make sure you don’t trip over anything in the middle of the night. Solar-powered showers and ovens can also help bring the comforts of home into nature without totally disrupting your vacation vibes. Boating can be a great way to untether physically from your everyday life, but it can also be scary if you’re completely disconnected. Keeping a laptop, phone and GPS system fully charged at all times can help you if waters get dicey or you lose your closest landmark. You may also want easy ways to charge up devices or appliances if you’re staying on a boat long-term. Luckily, there’s almost always an abundance of sunshine on the open waters, making it the perfect opportunity to utilize solar power. Because you’ll be on the water, you’ll want to look for something that can get a little wet. 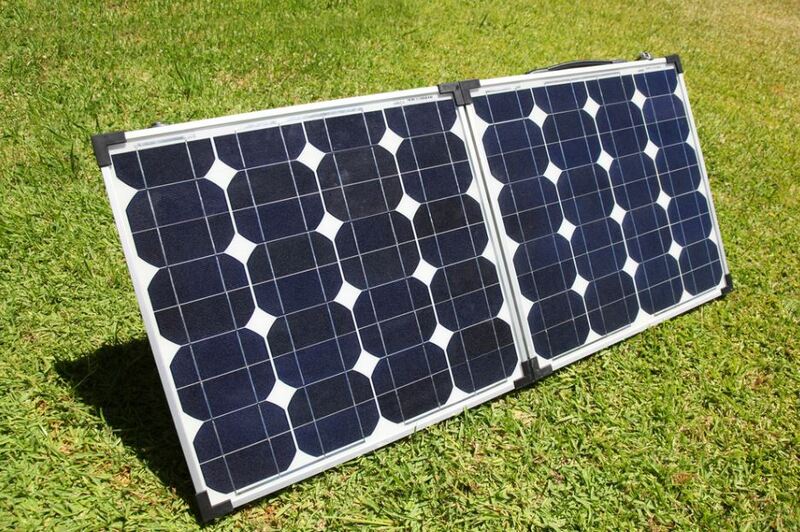 Voltaic Systems has a number of waterproof solar panels, as well as waterproof cases for their solar charging kits. An emergency weather and AM/FM weather radio can also keep you prepared and aware of any hazardous conditions. Look for a solar-powered model like RunningSnail’s solar-crank operated radio. Those who choose to travel in an RV know they need a bit more bang for their buck. This is where you look for a portable power station to power everything you need. Once you have one of those, you can find a sturdy or a flexible solar panel setup – depending on your RV model – to make your travels more sustainable, and to charge and recharge your powerstation in a way that’s easy and cost-friendly. From there, you can begin to have a bit more fun with solar-powered tools, like window chargers, patio tables for game nights on the road, and even a coffee-maker powered by the sun. With all these comforts and the freedom of the open road, you may never want to go back to a regular house.